This Poltergeist is personal. The eldest daughter ("Kendra") is played by Saxon Sharbino who, along with her younger sister, Brighton, and their younger brother, Sawyer, grew up just five houses down the street from us, splitting their time between L.A. and FloMo. It's always a surreal joy to see Saxon or Brighton or Sawyer popping up on something like Hannah Montana or Once Upon a Time. To Saxon's credit, this is a 'feature' role and the re-make of a sturdy classic and she appears prominently throughout, so it's particularly gratifying and all the more so because she does a flawless job here. And do not be misled: the movie is way better than its trailer. The Poltergeist trailer never excited me, and it's true the film periodically suffers from a mild identity crisis, rarely knowing whether it's a "ghost movie" (about a haunting) or a "paranomormal movie" (about inexplicable events). Fortunately, having seen the original, we're familiar with where things are headed, but the haunted box of clowns, for example—among other distractions—gives one the wrong impression, while also having the pleasurable side-effect of generating an adventure story that unfolds in fun and unexpected ways. I was also pleased that the film is about frustrated spirits, the sort trapped in purgatory 'dying' to get out rather than malevolent demons who wish harm to their unsuspecting housemates. The former makes for a film you can sink your teeth into and relish, while the latter often makes me uncomfortable throughout or a bit sick to my stomach. This is no Amityville or Insidious or Exorcist but, rather, something along the lines of an M. Night Shyamalan production. As for whether or not the film is "recommendable," the answer is a resounding "Yes." In a word, I had a blast. The story is well-written, well-acted, and altogether well-done. Production value is high, effects are good (though computer-y), pacing is great, and the score is ominous and foreboding and periodically thunderous, as it should be. Acts I, II and III are structured well, and it has the ending everyone wants. I would not recommend it, however, for someone under the age of, say, 14 or so. It's got elements that would make for lasting nightmares. 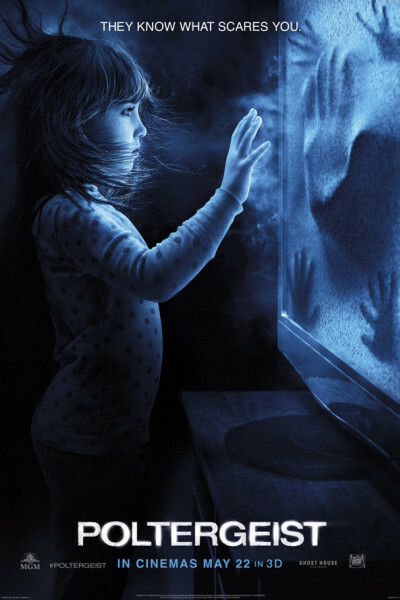 Poltergeist 2015 won't be another classic, but it holds up well by comparison to its predecessor and for those seeking an alternative to Tomorrowland this Memorial Day weekend—and wanting a scary date-movie to boot—see Poltergeist, and you'll enjoy yourself.